All transactions are safe and secure with a reliable history in online purchasing behind each of our associates. 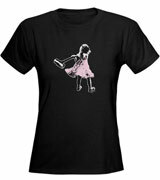 Buy the Bay's Hammer Girl Art t-shirt to own Switched at Birth clothing and merchandise. Bay Kennish may not understand where she fits in the art world or even in the world in general, but her love of street art has drawn her in for the long run. While many see her work as vandalism, her girl with the hammer and other objects could be considered inspirational and intriguing to others. If a love of art runs in your blood too, then be a walking billboard for Bay in a Hammer Girl tee. In addition to the Bay's Hammer Girl Art tee above, browse the Switched at Birth Clothing Gallery for more apparel like men's and women's clothes, kids shirts or hoodies.